Produktinformationen "GW Instek GW-GCM-403: Digital Clamp Meter"
The GW Instek GW-GCM-403 is digital clamp meter can measure AC/DC voltage, AC/DC current, resistance, diodes, continuity, capacitance, frequency and temperature. Tapered jaws, auto range, data hold, REL function and auto power off which makes it a superb tool for electricians. 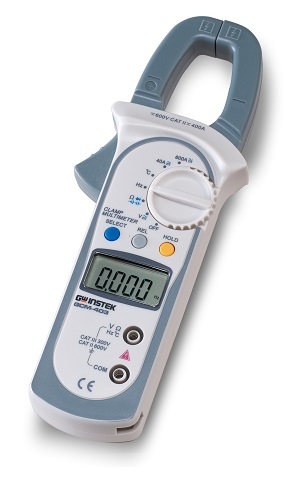 The GW Instek GW-GCM-407 is digital clamp meter with true RMS measurement. Featuring tapered jaws, a wide range (AC 600A/750V, DC 1000V max input), capacitance measurement as well as non-contact voltage sensing function and the ability to keep MAX/MIN or hold data and automatically power down make the GCM-407 suitable for almost any cable measurement task. Weiterführende Links zu "GW Instek GW-GCM-403: Digital Clamp Meter"